Warner Communications has a wide selection of DMR portable two way radios for sale. As an authorized dealer for the industry’s top manufacturers, we offer expert sales, programming and repair for DMR portable radios. Contact us today to get a quote. Product Features: Our rugged DMR portable two way radios are built for durability and designed for superior voice and data communication performance. 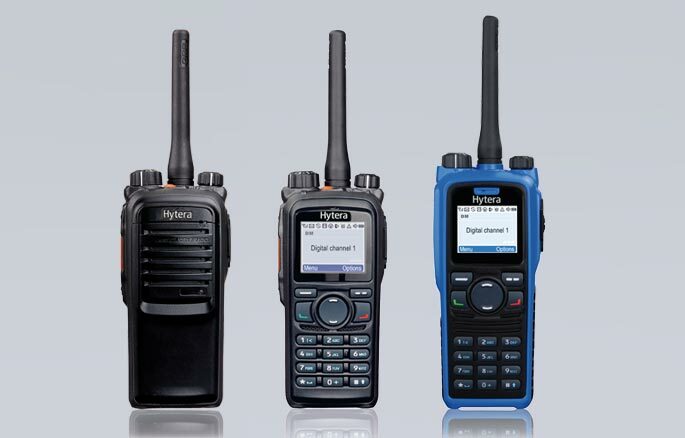 These advanced portable radios meet DMR, IP67 and MIL-STD 810 standards. They feature large-size color display for user friendly visibility (even under extremely strong light), noise canceling for superior voice quality, TDMA technology for higher spectrum efficiency and higher channel capacity, and enhanced encryption capabilities for secure communication. Our DMR portable radios are dual mode (analog + digital) to ensure a seamless digital migration. They also offer multifaceted communication services such as text messaging, scan, emergency, man down, roaming, vibration, high speed data transmission, lone worker, radio check, remote monitor, call alert, radio enable and radio disable.